Quantifying the cost of cloud ownership is no simple task. Take some of these tips to measure the ROI of your cloud spending. Getting an accurate assessment of the total costs of public, private, and hybrid clouds requires thinking outside the invoices. The big question facing organizations of all types and sizes is this: “Which is more cost-effective for hosting our apps and data, in-house or cloud?” While it may not be possible to achieve a truly apples-to-apples comparison of the two options, a careful cost accounting can be the key to achieving the optimal balance of public, private, and hybrid cloud alternatives. If accountants ruled the world, all business decisions would come down to one number: maximum profit for the current quarter or year. In fact, basing your company’s strategy solely on short-term financial returns is one of the fastest ways to sink it. Yet, so many IT decision makers look to a single magical, mystical (some would say mythical) figure when planning their tech purchases: total cost of ownership, or TCO. Determining TCO is particularly elusive when assessing cloud alternatives to in-house development and management of an organization’s apps and data. How do you quantify accurately the benefits of faster time to market, for example? Or faster and simpler application updates? Or an IT staff that’s more engaged in its work? These are some of the questions posed by Gigaom Research’s David S. Linthicum in a May 9, 2014, article. Linthicum points out that while tools such as Amazon Web Services’ TCO calculator, Google’s TCO Pricing Calculator, and the collection of cost calculators at The Cloud Calculator help you understand the "simple costs and benefits" of using cloud services, they exclude many of the most important aspects of the to-cloud-or-not-to-cloud decision. The most glaring shortcoming of TCO calculators is their one-size-fits-all nature. By failing to consider the unique qualities of your company—your business processes, the skill level of your staff, your existing investment in hardware, software, and facilities—the calculators present only a part of the big picture. As tricky as it can be to get an accurate read on the total cost of public cloud services, calculating the many expenses entailed in operating a private cloud setup can leave experienced IT planners scratching their heads. In a September 9, 2014, article on ZDNet, Intel’s Ram Lakshminarayanan outlines four areas where the costs of public and private clouds differ. 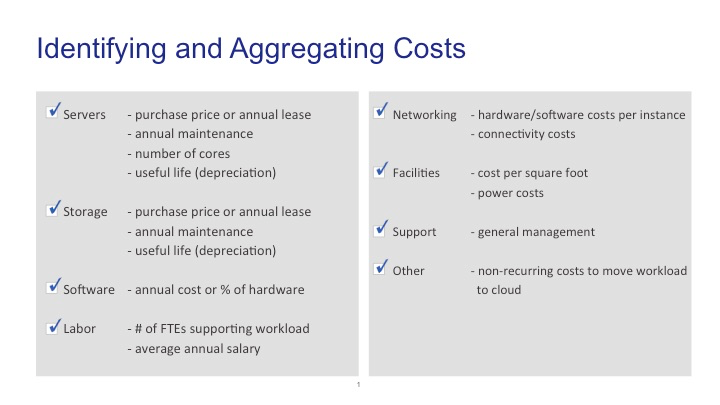 The biggest cost difference between public and private cloud setups is in infrastructure. Private clouds require upfront expenditures for compute, network, and storage hardware, as well as ongoing costs for power, cooling, and other infrastructure. Public cloud services charge based on pro-rata, per-hour use, although their rates cover the providers’ hardware and facilities costs. Likewise, support costs that are built into public cloud rates are a separate line item for most private clouds and must be negotiated separately in most cases. Finally, IT staff training must be considered both an upfront and continuing cost that will likely be higher for private clouds than their public counterparts, which benefit from straightforward dashboard interfaces designed for end users. A prime example is the Morpheus application management service, which features an intuitive UI for provisioning databases, apps, and app stack components on private, public, and hybrid clouds in just seconds. The Goldilocks cloud solution—the one that is "just right" for a great number of small and large organizations—is the hybrid approach that mixes public and private components. This allows the companies to benefit from the public cloud’s efficiency and cost savings while protecting critical data assets in a private cloud. Accurate cost accounting is imperative to ensure both sides of the cloud equation are applied to provide the best advantage for your firm’s data needs. Last but not least, consider fees related to the cancellation terms stipulated in the cloud service’s contract. Also factor in the cost of migrating to an alternative cloud provider to avoid being squeezed by vendor lock-in.